The small community of San Ygnacio was settled in 1830. The San Ygnacio Historic District includes Spanish and Mexican-influenced buildings that date from this earliest period of settlement up to the late 19th century. The majority of the buildings in the town are masonry, constructed of massive blocks of sandstone surfaced with stucco. The buildings are generally rectangular with flat roofs. Window and door openings have decorative surrounds, and many have prominent carved cornices. The San Ygnacio Historic District is bounded by the Rio Grande, U.S. 83, Mina and Matamoros sts. La Paz County Historical Museum is located at 305 Lincoln St. in Benevides Elementary School and is open 8:00am to 5:00pm Monday-Friday, September-May. For further information call the musuem at 956-765-8312. 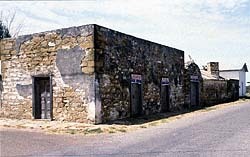 San Ygnacio Ranch Buildings have also been documented by the Historic American Buildings Survey.